The purpose of the tour is to make it relaxing and enjoyable. Getting to know each other far away from the concrete jungles of Singapore. Not to visit as many places as possible. Time out and be one with nature - crystal clear waters of Lake Inle, blue skies, blue green mountains and golden sunset, breathing in unpolluted fresh air. Friendly villagers. No high rises. Peace of mind away from deadlines. Singapore - Yangon (ETA 9.30 am). Yangon - Heho Airport (ETA 5 pm). Heho-Myanmar Treasure Resorts Inle, - (ETA 7 pm, dinner in Hotel). 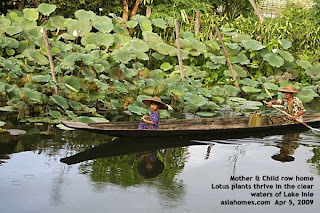 10 am - Relaxing Lake Inle Boat Tour and photography of sceneries. 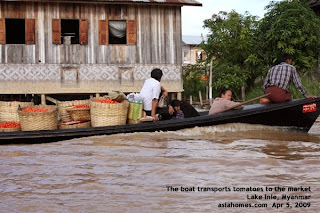 Vist tomato and other farms, one-legged fisherman and nearby villages. Ask the boat man to stop if you wish to take certain scenes. 1 pm - Lunch near the Phaung Daw U Pagoda. Visit the Pagoda - one of the 3 principal shrines in Mynamar. Houses five 12th century Buddha Images). 3 pm - Visit Cat Jumping Monastery (160 years old) and visit surrounding villages. Late breakfast and lunch combined. Relax. 12 noon. Half-day trip to visit hill tribe areas. Trekking along the blue mountains by Lake Inle. 6pm Dinner at a good restaurant. 8pm Back to Hotel. Relax. After breakfast, go to Heho Airport and Yangon. Return to Singapore. Please keep your notebooks, handphones and PDAs in Singapore. They may not work in Lake Inle. Myanmar Treasure Resorts, Inle is an upscale hotel (5-stars).